I’ve already reviewed this episode (the back of the box lists it as a “double-length episode” rather than a two-parter), and have nothing important to add; go read that if you missed it the first time. Lewis Black is the special guest vocal star in this episode; he plays a fat New Yorker who manages to capture video of what he believes are “kung fu frogs” on his cell phone, and the turtles must try to recover it from him. The episode mostly deals with Raphael and his anger issues, hence the name. The real entertainment value, though, is Black, at least partially due to the sheer surprise of his voice on this show, though it works perfectly for the character. We had cell phone videos last episode; in this episode, Michelangelo makes a “friend” on a fictional social network site. This series makes a point of showing that it’s set in the modern day. Anyway, Michelangelo’s new friend turns out to be a high-ranking member of the Foot Clan. We are introduced to Chris Bradford and Xever, who will eventually become the Rocksteady and Bebop of this continuity as Dogpound and Fishface. This episode introduces another TMNT regular supporting character, the villainous Baxter Stockman, though in this case he’s not so threatening; he’s shown as a nerdy character who wears a bright pink sweater. The turtles accidentally power him up; Donatello’s use of scavenged military tech to make a music player, surprise, surprise, turns out to not be such a good idea when Stockman picks it up. The episode title becomes ironic as the series later features the Turtles unable to remember Stockman’s name as a running gag. 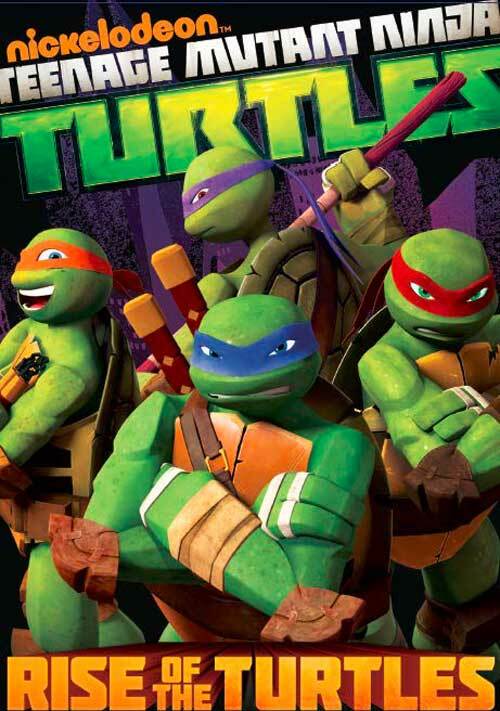 This episode is basically a retread (already) of “Turtle Temper,” with Donatello replacing Raphael as the turtle who is momentarily given a time out by Leonardo until he learns a lesson from Master Splinter and returns in the nick of time to save his brothers. It also features the second episode in a row where a piece of equipment by Donatello is used by the episode’s villains; this time around, Donatello using Kraang tech to make the titular robot backfires when the Kraang find it a perfectly acceptable substitute for their own robots. That said, this is my favorite episode of this DVD, and possibly the series so far, because it’s hands down the funniest. Donatello accidentally broadcasting his fawning over April via Metalhead is hilarious, as is his complaining that his only weapon against superior alien technology is essentially a stick. The DVD contains two main bonus features. Each episode comes with a making-of animatic for those of us interested in the behind the scenes process of a modern day CGI cartoon show. Despite the box proclaiming that “Rise of the Turtles” is one giant episode, there are six of these. The other bonus is a ”karaoke” version of the theme song; I of course prefer the original cartoon show’s version, but this song is pretty catchy in its own right. Also, note that this is a “karaoke music video,” not a “sing-along;” this is a boy’s show. Boys can karaoke; sing-alongs are for girls. If you’re still into that whole “physical media” thing, these are nice to own (assuming you enjoy this show; you should at least give it a try). Unlike the My Little Pony DVDs, since the episodes are in chronological order, getting them makes a bit more sense.